The term “urban ninja” usually brings to mind parkour enthusiasts springing and rolling their way across town, but Donut Games’ Urban Ninja app for the iPhone features a blue-clad French ninja named Francois. By jumping, climbing, and sometimes sneaking across the city while avoiding various obstacles that stand in his way, he attempts to complete classified missions given to him by his agency. He’s a little cocky and a lot silly but he gets the job done. Francois will use his ninja skills in jumping and leaping to get across the obstacles in his way–namely menacing little floating wheels, canons, and the occasional gap between buildings–with the objective of reaching the waiting helicopter that will whisk him away to safety. Help him do this by tapping on the screen in the direction of where he should go next, then release your finger and watch him jump. A health bar at the upper left hand corner allows you to monitor how much energy he has left in order to make those big jumps. Watch this bar carefully because if Francois runs out of energy to jump, you’re not likely to get anywhere. Re-fuel that health bar by collecting stars that are scattered throughout the game. Create combos by collecting the stars in a row to get more points; big stars are worth twenty-give points. When you reach the helicopter, try your best to jump on the waiting rope as low as possible. The lower you start, the more points you get as the rope is reeled up into the helicopter. It is very important to get a certain number of points because if you don’t score the required minimum, the mission is a failure and Francois will cry when he returns to the helicopter in shame. 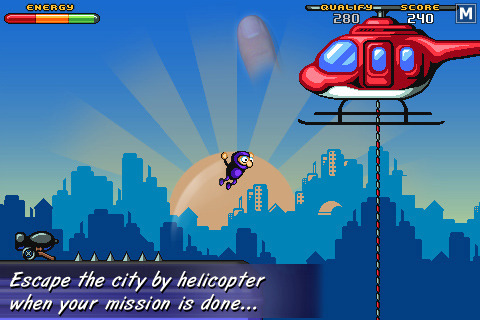 Urban Ninja is a rather big game with forty levels that must be unlocked in order and a three-star ranking system to allows for plenty of replay. Each level gets progressively harder to make things interesting as you perfect those ninja skills. With the three-star ranking system, you can try to beat your best score each time you play. You can also submit your scores online and see just how good you really are at jumping compared to the rest of the gaming community. The graphics are really bright and colorful with delightfully detailed art. Even the background has some depth to it with different layers of city buildings in this urban setting. Sneaky super agent music plays in the background, mixing with the sounds of the rotating helicopter blades and city life. Urban Ninja is a great strategy game that encourages efficiency and a little geometry to have Francois land those jumps while wasting as little energy as possible. I found myself really enjoying the game as I progressed through the levels. Francois is very entertaining and the urge to collect every single star off the map is difficult to resist. A very well made game, Urban Ninja is definitely worth the money. As of this review, Donut Games is giving Urban Ninja way for free but don’t expect that to last so hurry and download it now. 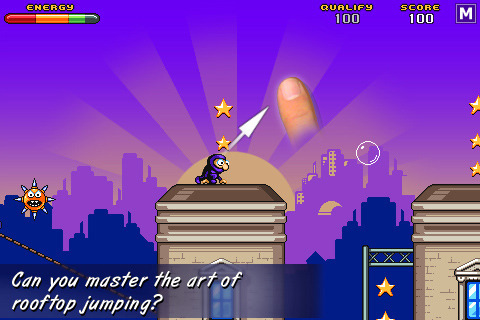 AppSafari review of Urban Ninja was written by Julie Guan on March 21st, 2011 and categorized under App Store, Fun, Games, Line Drawing, Strategy. Page viewed 4635 times, 1 so far today. Need help on using these apps? Please read the Help Page.